When a mass shooting happens in Russia, it seems almost unbelievable at first – especially due to the fact that gun laws are very strict in the country. The mass shooting in Belgorod last week was terrifying – and the immediate aftermath no less so. Pundits and politicians alike compared it to an “American-style scenario,” evoking the horrors of the Aurora and Sandy Hook shootings. It was an obvious comparison to be made, and it made sense. We are sadly used to this kind of news coming out of the United States. When it happens in Russia, it seems almost unbelievable at first – especially due to the fact that gun laws here are much stricter (it is currently believed that the Belgorod perpetrator, Sergei Pomazun, got his hands on weapons by stealing his father’s rifle and robbing a hunting store, before shooting at people on the street). Then again, it must be noted that unlike the loners who were seemingly law-abiding until they committed the Aurora and Sandy Hook shootings, Belgorod shooter Pomazun had a criminal record. Pomazun’s experience of harsh prison life is likely to have at least partially inspired his violent behaviour. “I wasn’t shooting at kids, I was shooting at hell,” Pomazun said after his apprehension. “Oh, that makes sense then,” a policeman is heard to respond sarcastically on video footage filmed immediately following his capture. Two of Pomazun’s six victims were teenage girls. His father has since told journalists that it would have been better if his son had turned the gun on himself. Pomazun’s page on Odnoklassniki, a popular social networking platform in Russia, was flooded with messages of grief and disgust. 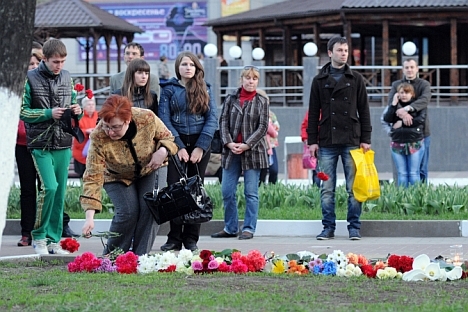 People were seen fainting at the site of the shooting in Belgorod, as others brought flowers. A crowd of over a hundred people mobbed the police car that transported the captured Pomazun to court. But let’s take a closer look at the manhunt for Pomazun. As prominent Russian journalists – Oleg Kashin among them – have noted, it was almost odd how little panic there appeared to be at the news that a clearly unstable, violent killer was on the loose somewhere in the Belgorod Region. Everyone was, of course, coming off the intense situation in Boston just a few days before, when an entire major US city went into lockdown as the police searched for suspected terrorist Dzhokhar Tsarnaev. In light of what happened in Boston, the reaction to Belgorod did seem underwhelming – even as the police patrolled all of the major routes out of Belgorod. Where was the urgency? Why weren’t people being told to stay indoors and not come out? Yet as some of my American friends have pointed out, not everyone agrees that the Boston lockdown was a good idea. Some have worried that it made the United States look “weak,” saying that the symbolism of deserted Boston streets was too much to bear. “A major city was brought to its knees by one man,” critics have claimed. Of course, hindsight is always 20/20. I doubt anyone would be saying such things if Pomazun had gone on to kill more people following his initial shooting spree. And the capability of the Belgorod police to institute a major lockdown – not to mention citizens’ readiness to obey the rules of this hypothetical situation – is in serious doubt either way. Perhaps the biggest lesson of the Belgorod tragedy so far is the fact that felons like Pomazun frequently fall through the cracks. Security services don’t watch them like they watch Islamists (the Russian FSB did warn the FBI and the CIA about the elder Tsarnaev brother’s possible extremist leanings, after all). They’re not encouraged to go to a therapist – people reason that to a hardened criminal, a therapist is of no use. Their family members are frequently apathetic toward them. And yet these are the people who are also good at violence – good at shooting to kill, good at stabbing cops (Pomazun stabbed a policeman four times in the course of his capture; the officer is now recovering in a hospital), and so on. It’s hard to assert that a good rehabilitation programme would have helped Pomazun exorcise his demons, but, once again, hindsight is 20/20.